Looking to expand your marketing knowledge and skillset? These awesome marketing podcasts will surely get you there! I know you are quite busy. As a marketer myself, I can understand that a day in the life of a marketer involves putting out fires left and right! Creating content for the company newsletter, maintaining the quarterly digital spend, reviewing the ad copy for Facebook etc are just a few of the tasks we carry out on a day-to-day basis. However, we wouldn’t be doing it if didn’t love, right?? Well, I can safely assume that the marketers or business people reading this blog love what they do and are constantly looking out for new ways to reach audiences. Marketing in this digital era is all about speed and productivity. You have to allocate every minute of your time and make sure you are on top of your game 24×7. This means learning new skills, tactics, strategies, and staying on top of trends. But with your tightly packed marketing schedule, it’s difficult to stay on top of all the latest trends and learn new strategies to grow your business. Well, this is where Podcasts come in. Podcasts aren’t just great. They are insanely awesome! Why? Well for starters… podcasts are portable. That’s right; since they are essentially audio files, you can take and listen to them anywhere – while you’re taking your morning shower, during your commute to work, over your lunch break, or at the gym! Unlike when you are reading a blog post, ebook, or watching a video, you don’t have to dedicate 100% of your time and attention to consume a podcast. You can multi-task! Perhaps that’s why podcasts are so successful. A whopping 26% of Americans (73 million) listen to podcasts at least every month – up from 24% in 2017 and one-third of Americans ages 25 to 54 listen to podcasts monthly! Those are some serious numbers that continue to grow every single year. Oh and just to give you some context, only 20 percent of Americans use Spotify monthly! Podcasts are way too popular than one might think! There are over 550,000 podcasts out there. How the heck do you choose which podcast is worth your valuable time? Well, you’re in luck. We’ve put together a list of 10 of the BEST marketing podcasts for your listening enjoyment! Following the name of the podcast, the show is hosted by John J. Wall and Christopher S. Penn in a local coffee shop every Thursday morning. Each episode of the Marketing Over Coffee podcast is about 20 minutes long and is filled with the kinds of marketing tips and tricks that you can only get from casual conversation outside of the office. 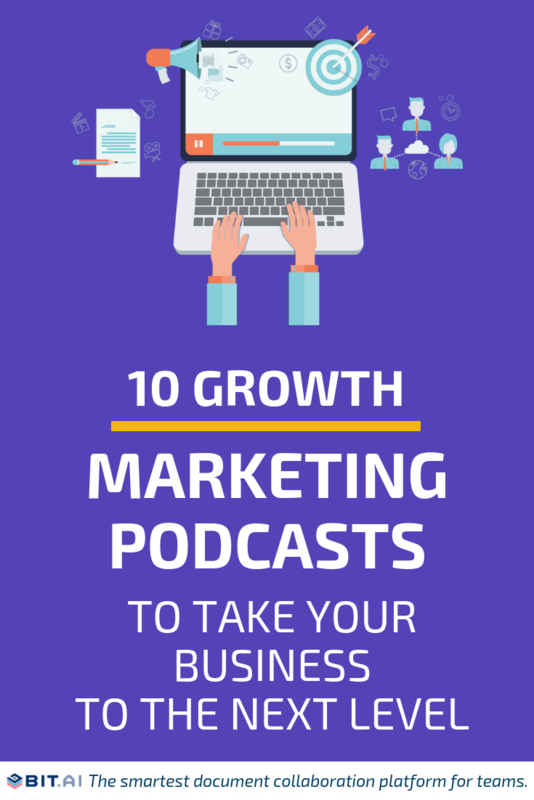 It’s a perfect companion to your morning breakfast, workout, or office commute, making it one of our favorite marketing podcast on this list! Being in marketing or in the startup ecosystem, chances are you might have heard of Gary Vaynerchuk. Considered by many a “purebred” entrepreneur, Gary is a CEO of a marketing agency (Vaynermedia), investor, vlogger, and a keynote speaker. Gary grew his Dad’s liquor store business from a $3 to $60 million dollar business in 5 years on the back of email marketing. He was one of the few people who started their own YouTube show right at the dawn of the platform back in 2006 and was one of the first people to reach a million followers on Twitter. Gary is an internet pioneer and spits out pure knowledge on how to build and sustain a social media audience with hard work and patience. A must listen! Brought to you by the team at Unbounce, the landing page builder. Unbounce knows a thing or two about converting your site visitors into subscribers and optimizing conversions at every step of the marketing funnel. The Call to Action podcast delivers top-notch content marketing tips through interviews with thought leaders. Tune in every Wednesday as Unbounce speaks with marketing directors, managers and thought leaders who are driving innovation and growth. Call to Action is a great podcast for getting different points of view from industry specialists and hone your craft for better conversions. Created by the team behind copyblogger.com, Copyblogger FM is a weekly podcast hosted by the chief digital content officer of Rainmaker, Sonia Simone. Even though the podcast’s focus revolves around copywriting, it also covers topics like SEO, email marketing, digital marketing and much, much more in depth. Apart from the Copyblogger FM, marketers can take actionable advice from the entire Rainmaker network as it brings you the best tips, tactics, stories, and strategies that provide acceleration for your business. This is a podcast by the good folks at social media examiner, so you know it’s going to be quite insightful! Social Media Marketing provides you with quick tips for marketing your business. Discover success stories and expert interviews from leading social media marketing pros in a weekly 45-minute podcast. Listeners can quickly gain insights into how successful businesses employ social media, learn new strategies and tactics, and gain actionable tips to improve your social media marketing. We cannot really have a discussion about marketing without mentioning Neil Patel now, do we? In a byte-sized podcast (averaging just 10 minutes! ), Neil Patel (CrazyEgg & Kissmetrics) and Eric Siu (Growth Everywhere & Single Grain) talk about unconventional marketing wisdom. From SEO trends for the future, growth hacks to grow your website traffic, to social media insights, Neil and Eric provide you with a lot of marketing information in the least possible time, leaving you with enough to go out there and execute said strategies. Hosted by leading online marketing strategist, Amy Porterfield, Online Marketing Made Easy puts its primary focus on small business owners and solopreneurs who have decided to embark on the entrepreneurial journey but don’t know where to go next. Thinking about creating an online course? Want to promote with webinars? Need help with your Facebook ads? These are just some of the questions that Amy helps you find answers to in a fun, casual, and at the same time, highly actionable podcast. Although most people think content marketing is brand new, telling stories to attract and retain customers is, perhaps, the oldest of marketing disciplines. This Old Marketing celebrates that fact! Joe Pulizzi and Robert Rose, two of the most well-known experts in the content marketing space, discuss the latest and greatest in content marketing trends and how marketers can take the help of flawless storytelling to attract and retain customers. Each 60-minute episode of This Old Marketing covers content marketing news, a one-minute rant on something Joe and Robert feel is absurd in the field of content marketing and “example of the week” which dissects a content marketing lesson from the past that we can all still learn valuable lessons from. If you use Buffer for your social media automation, you might dig this podcast from their team. Posted every Monday, The Science of Social Media shares the most cutting-edge social media marketing strategies from brands and influencers in every industry. Since social media plays a central role If you’re a social media team of one, business owner, marketer, or someone simply interested in social media marketing, you’re sure to find something useful in each and every episode. The Growth Show is hosted by HubSpot’s vice president of marketing, Meghan Keaney Anderson. If you do any sort of inbound marketing or use any CRM tool, I’m sure you have heard of Hubspot, one of the biggest players in the sales and content marketing space. Hubspot knows that “It’s never been easier to start a business, but it’s never been harder to succeed”, and thus makes sure to interview influential people who have “made it” to provide listeners with actionable advice on how to grow a business, an idea, or a movement.